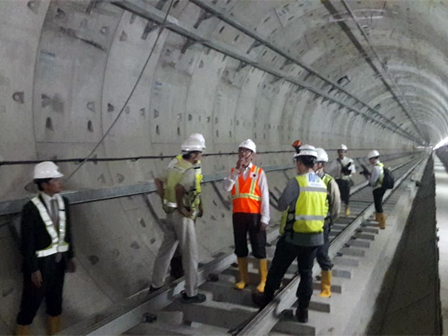 Jakarta PT MRT President Director, William Sabandar revealed, his party received a visit from the Japanese Foreign Minister, Taro Kono to the Jakarta MRT project, on Monday afternoon (6/25).
" In the visit, Mr. Kono appreciates the development of MRT that is almost done"
The visit was to closely see the progress of MRT train construction project at HI Roundabout Station, Tanah Abang, Central Jakarta. "In the visit, Mr. Kono appreciates the development of MRT that is almost done," he expressed, Tuesday (6/26). He explained that the minister also reviewed some points of the public transport project, including the top and the ground floor where the area will later become MRT platforms. Additionally he also saw the rails to the tunnel that is part of the train operation track. "I also explained about the preparation of commissioning testing," he said.